To access it you have to navigate to the Appearance / Customize/Site Identity. Here you can change the site title. 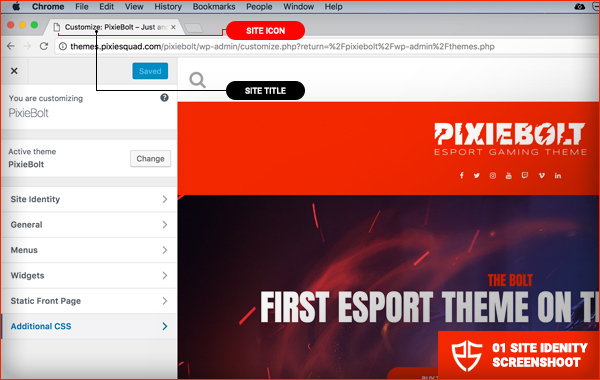 The site title is displayed on the top of your browser in your website’s tab. They provide context for your title, if it doesn’t already clearly indicate what you do. They emphasize or draw attention to the purpose of your site. They set the tone for your site. They contain keywords that will help your site show up in searches. Here you can add the favicon, it is used as a browser and app icon for your website. The favicon MUST be squared and at least 512x512 pixels. To upload it simply click SELECT IMAGE, upload your image & click save. Note: Do not forget to click SAVE CHANGES after you are done.